Lorraine M. Anderson (95) died peacefully at her home on April 2, 2019 cared for and surrounded by her children. Lorraine was born March 30, 1924, on the family farm in Kinnickinnic Township to William and Clara Stapleton. Together with brother Robert and sisters, Anne and Joyce, she grew up running throughout the Kinnickinnic Valley and attended the one-room Monument School House. She graduated from River Falls High School in 1941. She lived with her favorite aunt Mary in St. Paul while working at Montgomery Wards during the war years. On May 10, 1947, she married the love of her life, Quentin Anderson, of River Falls. The couple lived in Hudson, then River Falls in homes they built together. They raised their six children surrounded by love and lilacs near the Kinnickinnic River. As she recovered from breast cancer in the 1970s she took up painting as therapy. Painting on canvas or china brought peace and joy to her, and beauty to the rest of us. In her later years she discovered she was a gardener: tending flowers and mowing grass into her 90s. She enjoyed reading, baking, and charming her family and friends over coffee and cookies. She had the gift of making everyone she chatted with feel special and cared for. We will miss her. Lorraine was preceded in death by her husband of 54 years, Quentin, parents Bill and Clara Stapleton, sister Anne Wells, and brother Bob Stapleton. She is survived by her sister, Joyce Nelson of Hartland, Wisconsin; sons Neil (Judy) of River Falls, David (Patty) of River Falls, Dennis (Denice) of Hudson, Mark (Laura) of River Falls; daughters, Marilyn (Randy) of Eagan MN, JoAnn Nielson of Hudson; 15 grandchildren; 17 great-grandchildren and many nieces and nephews. The family is grateful to the special staff of Touching Hearts at Home and Adoray Hospice for the exceptional care and kindness they gave Lorraine and family when it was needed the most. 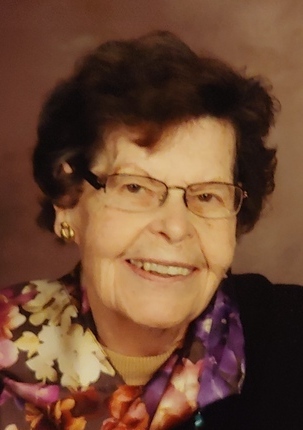 A private funeral service was held on Sunday, April 7, 2019 at St. Bridget Catholic Church with Fr. Jerry Harris officiating. Interment will be in Kinnickinnic Cemetery. Our Families Thoughts and Prayers are with you all!! Our prayers are with you all. There was never a day when I visited your mom, my cookie baking Aunt; that she was not sharing pictures and stories of you all with love and a big smile on her face. I will miss that stop off the highway when I get back to River Falks. I’m so sorry to hear this. Our tthoughts and prayers go out to all the family. I loved Lorraine, she was such a sweet lady. Sympathy for Lorraine’s loved ones. Lorraine was an awesome person. James Reardon . I live in New Richmond Wi. Anderson family you are in my thoughts and prayers! Your mom was always so sweet and kind! I am so sorry for your loss! Anderson family know you are in my thoughts and prayers! Your mom was always so sweet and kind, she loved her family so much!